Busy day! Short blog update. We got home yesterday. Annabelle has done great! She’s feeling good, tolerating feeds okay, peeing well, so YEAH! LOVES being home playing with her toys. Still pooping like crazy (TMI sorry!) but hoping that calms down next week after we can stop her Augmentin. Here’s a fun picture. 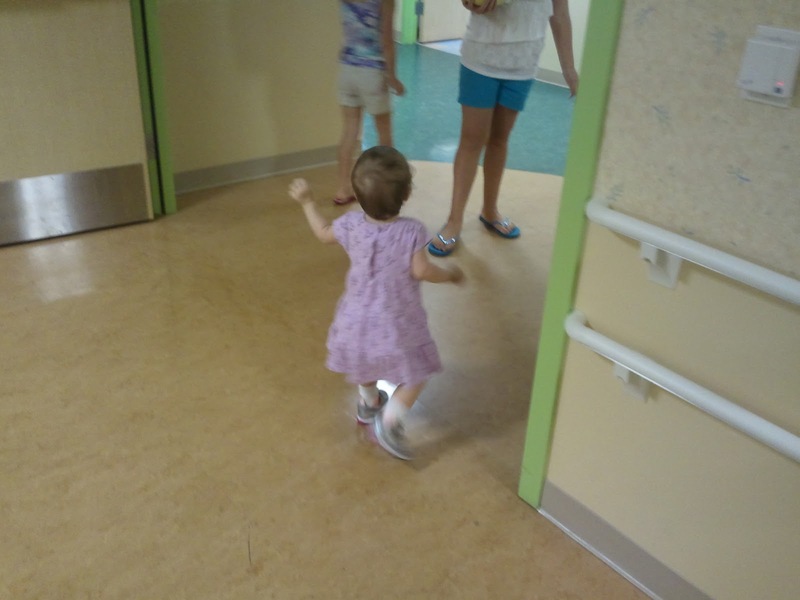 For the first time, Annabelle WALKED out of her hospital room. Literally. I set her down, turned around to get a bag, then hear some laughing in the hallway. Turned around to see Annabelle all but running down the hall, the nurses laughing at her. Yeah, she was ready to escape! She is so cute…love that she is running to get out of there! Got on here tonight to get caught up. I found myself in the ER around 4:00 AM on Thursday, got sent home today. I agree with Annabelle, run and don't look back! Glad she is feeling better. Continued prayers!